According to the Los Angeles Times, South Los Angeles (formerly known as South-Central) ”is defined on Los Angeles city maps as a 16-square-mile rectangle with two prongs at the south end.” In 2003, the Los Angeles City Council renamed this area "South Los Angeles". The name South Los Angeles can also refer to a larger 51-square mile area that includes areas within the city limits of Los Angeles as well as five unincorporated neighborhoods in the southern portion of the County of Los Angeles. The City of Los Angeles delineates South Los Angeles as an area of 15.5 square miles. Adjacent neighborhoods include West Adams, Baldwin Hills, and Leimert Park to the west and the Southeast Los Angeles region of the city (the 26-neighborhood area east of the Harbor Freeway) on the east. According to the Los Angeles Times Mapping Project, South Los Angeles comprises 51 square miles, consisting of 25 neighborhoods within the City of Los Angeles as well as three unincorporated neighborhoods in the County of Los Angeles. Google Maps delineates a similar area to the Los Angeles Times Mapping Project with notable differences on the western border. On the northwest, it omits a section of Los Angeles west of La Brea Avenue. On the southwest, it includes a section of the City of Inglewood north of Century Boulevard. In 1880, the University of Southern California, and in 1920, the Doheny Campus of Mount St. Mary's College, were founded in South Los Angeles. The 1932 and 1984 Olympic Games took place near the USC campus at neighboring Exposition Park, where the Los Angeles Coliseum is located. Until the 1920s, the South Los Angeles neighborhood of West Adams was one of the most desirable areas of the City. As the wealthy were building stately mansions in West Adams and Jefferson Park, the white working class was establishing itself in Crenshaw and Hyde Park. Affluent blacks gradually moved into West Adams and Jefferson Park. As construction along the Wilshire Boulevard corridor gradually increased in the 1920s, the development of the city was drawn west of downtown and away from South Los Angeles. At the same time, the area of modest bungalows and low-rise commercial buildings along Central Avenue emerged as the heart of the black community in southern California. It had one of the first jazz scenes in the western U.S., with trombonist Kid Ory a prominent resident. Under racially restrictive covenants, blacks were allowed to own property only within the Main-Slauson-Alameda-Washington box and in Watts, as well as in small enclaves elsewhere in the city. The working- and middle-class blacks who poured into Los Angeles during the Great Depression and in search of jobs during World War II found themselves penned into what was becoming a severely overcrowded neighborhood. During the war, blacks faced such dire housing shortages that the Housing Authority of the City of Los Angeles built the virtually all-black and Latino Pueblo Del Rio project, designed by Richard Neutra. When the Supreme Court banned the legal enforcement of race-oriented restrictive covenants in 1948's Shelley v. Kraemer, blacks began to move into areas outside the increasingly overcrowded Slauson-Alameda-Washington-Main settlement area. For a time in the early 1950s, southern Los Angeles became the site of significant racial violence, with whites bombing, firing into, and burning crosses on the lawns of homes purchased by black families south of Slauson. In an escalation of behavior that began in the 1920s, white gangs in nearby cities such as South Gate and Huntington Park routinely accosted blacks who traveled through white areas. The black mutual protection clubs that formed in response to these assaults became the basis of the region's fearsome street gangs. 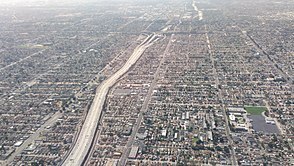 As in most urban areas, 1950s freeway construction radically altered the geography of southern Los Angeles. Freeway routes tended to reinforce traditional segregation lines. Beginning in the 1970s, the rapid decline of the area's manufacturing base resulted in a loss of the jobs that had allowed skilled union workers to have a middle class life. Downtown Los Angeles' service sector, which had long been dominated by unionized African Americans earning relatively high wages, replaced most black workers with newly arrived Mexican and Central American immigrants. Widespread unemployment, poverty and street crime contributed to the rise of street gangs in South Central, such as the Crips and Bloods. They became even more powerful with money from drugs, especially the crack cocaine trade, dominated by gangs in the 1980s. By the early 2000s, the crime rate of South Los Angeles had declined significantly. Redevelopment, improved police patrol, community-based peace programs, gang intervention work, and youth development organizations lowered the murder and crime rates to levels that had not been seen since the 1940s and '50s. Nevertheless, South Los Angeles was still known for its gangs at the time. In mid 2003, the City of Los Angeles officially changed the region's name from South Central to South Los Angeles, a move supporters said would "help erase a stigma that has dogged the southern part of the city." On August 11, 2014, just two days after the shooting of Michael Brown in Ferguson, Missouri, a resident of South L.A., Ezell Ford, described as "a mentally ill 25-year-old man," was fatally shot by two Los Angeles police officers (see Shooting of Ezell Ford). Since then, a number of protests focused on events in Ferguson have taken place in South Los Angeles. After the 2008 economic recession, housing prices in South Los Angeles recovered significantly, and by 2018, many had come to see South Los Angeles as a prime target for gentrification amid rising real estate values. Real estate values in South Los Angeles were further bolstered by news that Los Angeles will host the 2028 Olympics, with many of the games to be hosted on or near the USC campus. By the end of the 1980s, South Los Angeles had an increasing number of Hispanics and Latinos, mostly in the northeastern section of the region. According to scholars, "Between 1970 and 1990 the South LA area went from 80% black and 9% Latino to 50.3% black and 44% Latino." This massive and rapid residential demographic change occurred as resources in the area were shrinking due to global economic restructuring described above and due to the federal government's decrease in funding of urban anti-poverty and jobs programs, and other vital social services like healthcare. The socio-economic context described here increased the perception and the reality of competition amongst Asians, blacks, and Latinos in South LA. The results from the 2000 census which show continuing demographic change coupled with recent economic trends indicating a deterioration of conditions in South LA suggest that such competition will not soon ease." In the 2010 census, the area of South Los Angeles had a population of about 768,456. 64.0% of the residents were Hispanic or Latino, nearly 31.4% were African American. South Los Angeles is home to the University of Southern California, a private research university in the University Park neighborhood. It is California's oldest private research university. Almost all of the South Los Angeles Area is served by the Los Angeles Unified School District. There are some schools not within the LAUSD that also serve the South Los Angeles Area, such as independent private schools or charter schools. The following are some of the schools under the LAUSD which fall within the boundaries of the South Los Angeles region. The Los Angeles County Department of Health Services operates the South Health Center in Watts, Los Angeles, serving South Los Angeles. ^ a b "Map of South Los Angeles". Google. Retrieved 2009-05-28. ^ Sims, Calvin. "In Los Angeles, It's South-Central No More". ^ "The History of South Central Los Angeles and Its Struggle with Gentrification". KCET. 2017-09-13. Retrieved 2018-07-10. ^ a b Grant, et al. (1996), "African Americans"
^ a b c Darnell Hunt and Ana-Christina Ramon (eds.). Black Los Angeles: American Dreams and Racial Realities. New York: New York University. ISBN 978-0814737354. ^ Clora Bryant; William Green; Buddy Collette; Steven Isoardi; Marl Young (1999). Central Avenue Sounds: Jazz in Los Angeles. University of California Press. p. 225. ISBN 978-0-520-22098-0. ^ Ehrhard Bahr (2008). Weimar on the Pacific: German Exile Culture in Los Angeles and the Crisis of Modernism. University of California Press. p. 164. ISBN 978-0-520-93380-4. ^ John Buntin (2009). L.A. Noir. ISBN 978-0307352088. ^ "Gangs of Los Angeles (map)". Google. 2007-05-07. Retrieved 2009-05-28. ^ Matea Gold; Greg Braxton (2003-04-10). "Considering South-Central by Another Name". Los Angeles Times. p. 3. Retrieved 2014-07-17. ^ Mather, Kate; et al. (2014-11-25). "Michael Brown protester handcuffed outside LAPD headquarters". Los Angeles Times. Retrieved 2014-12-14. ^ Nash, Jim (2014-08-14). "Protesters in Leimert Park Join Nationwide 'Day of Rage' Over Ferguson Killing". KTLA 5. Retrieved 2014-12-14. ^ Mather, Kate, and Richard Winton (2014-12-09). "LAPD investigating officer's use of baton during protest". capitalgazette.com. Retrieved 2014-12-14. ^ "Beyond the "Black Beverly Hills": South L.A. Real Estate Heats Up With a New Hollywood Generation". The Hollywood Reporter. Retrieved 2018-09-19. ^ "Mapped: the future sites of LA's 2028 Olympic games". Curbed LA. Retrieved 2018-09-19. ^ ""Latinos Move to South-Central L.A. : Drawn by Low Rents, They Replace Blacks," '',''". Los Angeles Times. 1990-05-03. Retrieved 2014-07-17. ^ "USC Graduate Admission". Gradadm.usc.edu. Retrieved 31 December 2017. ^ a b c "School Directory". Schooldirectory.lausd.net. Retrieved 31 December 2017. ^ ""John Cage's Los Angeles"". Graphics.latimes.com. September 1, 2012. Retrieved 2014-07-17. Renwick, Lucille. "COVER STORY : THE MYTH OF South-Central : More a Stereotype Than a Place, It Is Defined By Ethnicity and Negative Media Images Rather Than Street Boundaries". Los Angeles Times. January 3, 1993. Kotkin, Joel (contributing editor of Opinion section) "COMMUNITY: Latinization of South Los Angeles" (Opinion). Los Angeles Times. May 28, 1995.